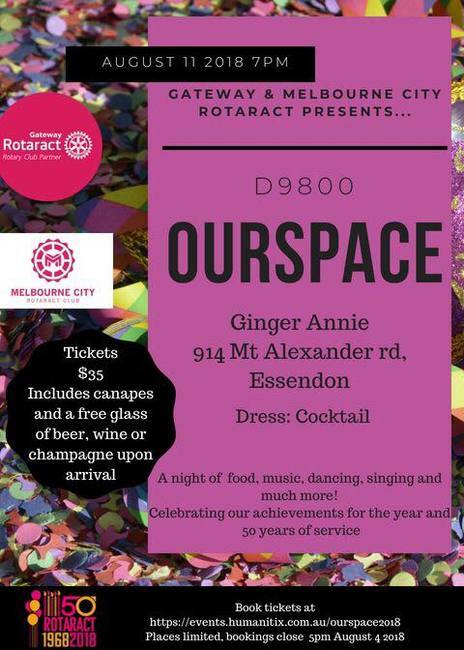 The Rotaract Clubs of Gateway and Melbourne City invite you to join us for OurSpace on Saturday the 11th of August. OurSpace is Rotaract District 9800's annual changeover event celebrating the young inspiring adults making a difference in local and global communities. It is a celebration for the past, present and future activities of Gateway and Melbourne City. We will also be celebrating Rotaract's 50th year of doing good in the world! Tickets are $35 and MUST be purchased prior to attending the event. Ticket includes finger food and a complementary glass of beer, wine or champagne upon entry. OurSpace welcomes everybody including friends, family, Rotarians and the wider community to enjoy a night of entertainment, celebration and delicious food. It is bound to be a fantastic event as always so get your ticket quick before you miss out!